Looking for the best Cross Country Skiing trails around Carthage? Find the top rated cross country skiing trails in Carthage, whether you're looking for an easy short cross country skiing trail or a long cross country skiing trail, you'll find what you're looking for. Click on a cross country skiing trail below to find trail descriptions, trail maps, photos, and reviews. I ride this trail everyday. There is not a ton of people on it so it's really nice. Not a lot of elevation gain. Perfect for people wanting to get into cycling. I can't wait till JTC can link up CJ to Carthage! The trail in Greene county is pretty good. It needs some tree trimming but the trail surface is solid. Thru Polk County not so much. Ruts, loose gravel, spiders repelling from low tree limbs. The scenery is nice but you need to keep eyes on the surface as it changes frequently from sand, dirt, gravel. Just when you direct your attention to the scenery the surface goes soft. If only the trail was maintained as well as the signs for it are. It starts out in Springfield as a beautiful paved trail for 8 miles, and then the trail deteriorates from there. I wanted to be sure to ride the whole trail, but it was terribly disappointing. Trail went from paved, to crushed limestone, to rocks, to sand, to single track with grass and weeds growing up to your knees. The markings for the mileage were good, but there are no restroom facilities at any of the trail heads where there is parking. When you get to Boliver, there are no markings telling you which way to head to get to food, etc. On the sign it says it's a premier trail. That is just not true. We had to clean our bikes and ourselves of spider webs. Nasty. I will say that there weren't mosquitoes at all, and maybe that's because of all of the spider webs. This trail is in need of maintenance big time. I rode this trail last summer from Springfield to Walnut Grove and back and really enjoyed it. This summer I stopped to ride the Northern section from Bolivar to Walnut Grove to see all the bridges. Ended up turning around just before Wishart due to all the low hanging tree branches and the spider webs that were hanging down between the tree branches on both sides of the path. After a couple of miles of plowing through them, I gave up especially after noticing a few dozen spiders crawling around my legs, arms, bike, helmet and across my glasses. I don't give up very easily but enough is enough. What a beautiful ride this trail would be if, like other trails, (especially the Katy Trail that I rode next), the towns along the trail would pitch in and trim it back. The Frisco Greenway is within a mile of my house. It is supported by local volunteers and donations. The surface is hard packed gravel that is appropriate for runners and hybrid bikes. It is well traveled during the daylight and has very few road crossings. There are some connecting paved bike paths (extra wide sidewalks) at about the midpoint of the trail. There is no water on the trail, but there is a porta-potty at the mid point and the south end. We ran a 25k on this trail. Started at Carthage parking lot in the park due to more parking for race participants and entered the trail at trailhead and went to Grant St in Oranogo and back to Carthage. Round trip 15.6 miles. It was small white crushed chat similar to the Frisco Trail in Joplin. Pretty level with only noticeable incline getting on the trail at Carthage Trailhead. A few areas had some grass grown up on the trail but paths were still easy to run thru or ride a bike thru. Scenery past a salvage yard at the start then mostly farm and ranch land. No lose pets. Heard a couple dogs in 2 yards and farm with a loud rooster. Absolutely pleasant Trail experience! If it was paved I would give it a 5. Would love to have a trail similar in our community!! I started our ride in Carthage with a couple of my grandchildren on mountain bikes. I did not know what to expect, but was pleasantly surprised. The trail was hard-packed gravel and was very smooth. We only went 3-4 miles west then returned. There are benches set up in several spots to rest. We all enjoyed the ride. I will be using this trail much more often. My wife will also join us on her beach cruiser. I was there last weekend and rode from CJ to where it basically ends just past CJ heading toward Carthage. I picked my bike up and carried it over the railroad tracks then road a bit further before it became covered in large rocks that you sink into and was so overgrown with weeds it basically didn't exist. We have just finished resurfacing 2 miles of the Ruby Jack from the Carthage Trail Head to Leggett and Platt. We placed fine gravel over the rough gravel that was there for several years. The trail is holding up well. There are plans to extend the trail 1.5 miles to the west towards Carl Junction. We should know by the end of the summer of 2016 when this will take place. The Rusty Chain Gang went from Bolivar to Springfield and spent the night at the Courtyard and went back the next day. No need to go into great detail as Emily's review was spot on. A mower and tree trimming is much needed on all sections of the trail. Some areas worse than others. A reminder to everyone there is no water on the trail and pack extra water with you. I had 3 water bottles but needed the 4th. I am looking forward in going back when I see some more positive feedback. It is a shame that a trail through such a gorgeous, natural area is so inconsistently maintained. 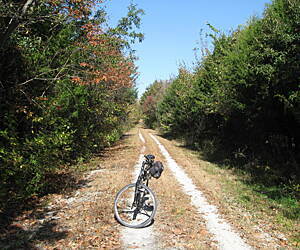 My husband and I rode from south of Bolivar (MM 31) north into Bolivar one day, and the second day rode from MM 31 south on the unpaved portion of the trail down to around MM 21. The paved portion of the trail was average; some roots, but overall decent. The road detour around Hwy 13 in Bolivar is rather long and a bit confusing if you don't know the area due to inadequate signage, but we figured it out. 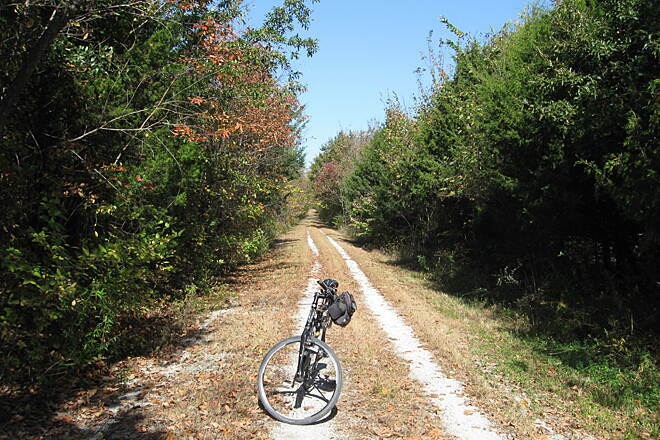 Parts of the unpaved section south of Bolivar were smoothly packed limestone and very easy to ride on our road bikes, which are equipped with wide tires (1.35"). However, a good mowing and branch trimming was needed as the grass and weeds were high, and occasionally the trail would almost disappear in the weeds. But this was tolerable compared to the conditions we encountered the farther south we got. We had hoped to make it to Walnut Grove at MM 16, but ended up turning around early due to the gravel conditions, mostly from the Little Sac River bridge (MM 23) to MM 21 (and probably farther south). This section appeared to have been relatively recently re-graveled, and not well. The gravel was larger and deeper than ideal (up to 3" deep in some places), leading to fish-tailing and difficulties controlling our bikes. I would recommend this section for mountain bikes only. It was nice to see that some maintenance had been done on this section, but unfortunately, it was not done well; the gravel was not spread evenly or thinly enough, making it somewhat hazardous and not fun to ride. The bridge conditions were also inconsistent. Some appeared in dire need of maintenance. One wooden bridge had a large hole where a plank was missing, a very hazardous situation. With more consistent and careful maintenance, this rail-trail could be the gem it should be, but it was a disappointing trail for us, especially compared to numerous other rail-trails we have ridden across the US. We parked one car in Joplin off North st at the beginning of trail and was able to get nice shaded parking spot and there is a porta potty in this lot. We then hoped in other car and drove to web city near broadway which was difficult to find the trail at first but ended up parking under some shade in the skating rink parking lot and walking towards broadway and cedar and saw the old rail road tracks across the road and saw the trail and began following it. It was me and my wife along with our three year old daughter. Well majority of the trail is shaded really nicely except for about just over half mile stretch when you get near Zora there is absolutely no shade and is burning hot on this stretch but other then this the entire rest of trail is nice and shaded even during hottest part of day. We started just after 3 PM and with out three year old walking herself majority of the way we finished around 4:45 PM but also between Zora and the Joplin starting point were we parked we came across a bridge were we spent some time playing in the water as well. The entire trail is all gravel and overall was an enjoyable afternoon. Would recommend this to anyone looking for a fun walk and without kids could probably be done closer to an hour.